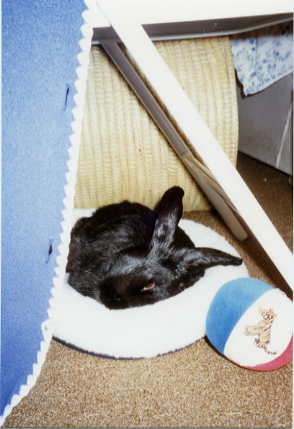 Our wonderful bunny Carolina, a sweet black rabbit with one ear up and one ear down, was the inspiration behind Cottontails (then The Rabbit Charity). She was very bright and would open and close doors and jump on our back to reach tasty treats – willow and apple twigs were her favourite. Carolina showed her affection and contentment by following us around, rolling on her back and sleeping by our bed. She considered herself top bunny, something which the foster rabbits who shared our home quickly came to accept! One of the things she taught us is how important it is to provide a friend for your rabbit. Carolina had two adoring boy bunnies – Benjamin and Sweetpea – to groom her, love her and snuggle up to her. As a free running house rabbit, she showed everyone who met her that a rabbit’s place is in the home, not a hutch. Sadly, we lost our Carolina in 1999, but we are continuing the work she started with Cottontails and Art Rabbit. We are very privileged to have cared for her and we couldn’t have wished for a better bunny.